There are natural substances that help block UVB/UVA rays and also help your skin respond better to sun exposure. 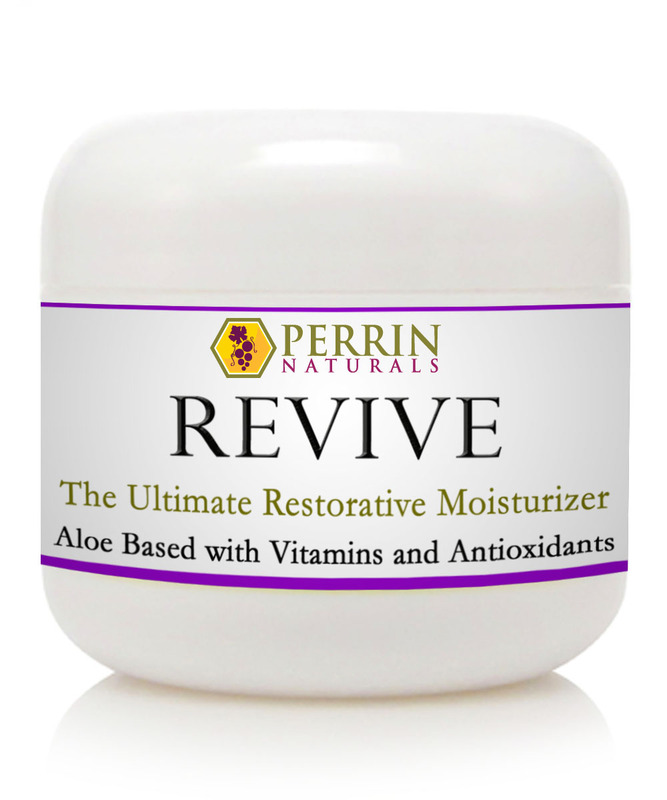 Perrin Naturals® All Natural Sunscreen combines these natural, restorative, and protective ingredients with the natural sun blocking power of zinc oxide. Formulated in a base of organic aloe vera, vegetable oils, beeswax, and organic shea butter. Enriched with antioxidants and vitamins that not only help correct existing sun damage but also work to prevent further damage. Zinc Oxide provides natural UVA/UVB protection. Organic Coconut Oil, Organic Shea Butter, Organic Jojoba Oil all have sunblocking capabilities. Vitamins C and E. Several studies have shown vitamin C and E help to protect against ultraviolet damage when applied topically as well as taken internally. Grape Seed Extract and Resveratrol help to correct existing sun damage as well as provide antioxidant protection from damage caused by UV rays. Organic Aloe Vera helps to lessen the burning of over exposure to the sun rays. Lightly scented with oils of vanilla, cinnamon, and patchouli. We at Perrin Naturals® have recognized for years that if we applied our creams (Creme Complete, Ultra Nurture, Lotion Rejuvenation) before and during sun exposure that we avoided severe sunburns, and many times avoided burning all together, even though most of us are fair skinned and prone to sunburns. This was exemplified further when we could recognize where on our skin we had applied our products and where we hadn't, by burning and peeling where we had not applied the creams. Even though we knew our creams lessened burning from sun exposure, we never promoted them as sunscreens. Because we have been consistently asked by our customers to develop a natural sunscreen, we decided to develop a sunscreen by using our creams as a starting point. We've incorporated the same basic corrective, moisturizing, and photoprotective benefits of our creams to create an All Natural Sunscreen with an SPF of 15, using a non-nano particle Zinc Oxide. Organic Coconut Oil, Organic Shea Butter, Organic Jojoba Oil and Beeswax all have sun blocking capabilities. Organic aloe vera, zinc oxide, organic coconut oil, emulsifying wax (vegetable derived), organic jojoba oil, organic shea butter, grape seed oil, beeswax, organic castor oil, organic rosehip seed oil, lecithin, organic vegetable glycerin, vitamin E in soy oil, pure honey, vitamin C, alpha lipoic acid, vanilla essential oil, n-acetyl cysteine, grape seed extract, resveratrol, organic corn starch, sodium bicarbonate (baking soda), cream of tartar, xanthan gum, vanilla absolute, cinnamon essential oil, patchouli essential oil. Apply evenly to areas of the body which are exposd to the sun. Reapply throughout the day, especially if getting in and out of water.